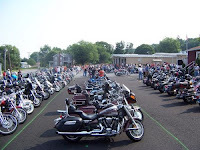 One of my favorite recurring "Ride to Eat" events begins its 2008 "season" this Sunday the 18th. The event hosted by the Lawn Fire Co. is growing in popularity, and for good reason: excellent location reached via twisty roads, very good chow, an eating area that is both open and protected, and a very well organized event. And, judging from the photo at right that is posted on the F.C. 's website, the previously graveled portion of the parking lot has been paved. So chart your favorite course to the Lawn F.C. each third Sunday from May through September. More event details and photos in this old post (note that the FC's URL has changed; it's now www.lawnfire.com).